David Nicholls brings the wit and intelligence that graced his enormously popular New York Times bestseller, One Day, to a compellingly human, deftly funny new novel about what holds marriages and families together -- and what happens, and what we learn about ourselves, when everything threatens to fall apart. Narrated from Douglas's endearingly honest, slyly witty, and at times achingly optimistic point of view, Us is the story of a man trying to rescue his relationship with the woman he loves, and learning how to get closer to a son who's always felt like a stranger. Us is a moving meditation on the demands of marriage and parenthood, the regrets of abandoning youth for middle age, and the intricate relationship between the heart and the head. And in David Nicholls's gifted hands, Douglas's odyssey brings Europe -- from the streets of Amsterdam to the famed museums of Paris, from the cafés of Venice to the beaches of Barcelona -- to vivid life just as he experiences a powerful awakening of his own. Will this summer be his last as a husband, or the moment when he turns his marriage, and maybe even his whole life, around? This novel is populated by characters that will feel familiar: most of us know a Douglas, well-meaning but almost completely incapable of spontaneity; Connie, beautiful, enigmatic and charming; Albie, filled with teenaged scorn for adult conservatism; the Petersen parents, repressed and disapproving (“Alcohol loosened inhibitions, and inhibitions were worn tight here”); Kat, rebellious and determined to shock. The plot is original and certainly takes a few unanticipated turns, a bit like the Petersen’s vacation: buskers, angry bikers, Carabinieri, an Amsterdam prostitute, undersized Speedos, a night in a jail cell and jellyfish were not expected to feature. 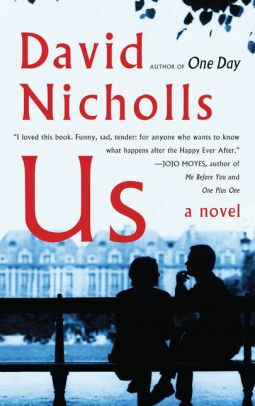 Nicholls gives the reader words of wisdom that elicit nodding agreement, lines that will cause smiles, groans and, in fact lots of laugh-out-loud moments, but he also causes the eyes to well up on several occasions. Nicholls treats the reader to some marvellous turns of phrase: “I had sweated feverishly in the night, the bedding now damp enough to propagate cress” and “together we had the grace of a three-legged dog, hobbling from place to place” are just two examples.